Hama’s wedge shaped AV Selector 100s certainly wouldn’t win any prizes for aesthetics. Offering three SCART inputs, one SCART output and two composite video and stereo audio outputs, this switch is designed with VCR users in mind. The switch offers the option of passing one of the SCART inputs over to another for recording, but of course this is useless to you when just trying to play games. Fortunately we can just ignore these features, as long as the RGB button on the far left is pushed in, we’re good to go. The buttons on the unit make a satisfying clunk when pushed and feel as if they are good quality. The audio from the composite video outputs can also be used to route to an external amplifier if necessary. Since output is via a SCART socket rather than a moulded wire, you can use any cable of your choosing with the unit and the sockets are spaced sufficiently apart that using more bulky SCART plugs will not be a problem. Conclusion:- Despite being told to avoid this switch by a poster on the Shmups forum, the AV Selector 100s actually passed all our tests easily. If placed next to your TV with cables spewing up from it, it’s unlikely to please spouses or girlfriends, but performance wise there’s no faulting it. It’s just a shame Hama don’t make a model with more inputs. Not the prettiest bit of AV gear, but a solid performer. Nice review Bucko, i’ll be getting one of these. Can you recommend a decent scart cable to use from my Trinitron to the switch? Pretty much any branded SCART to SCART should work just fine. No need to spend silly money. I’m in the US, and I’m in the process of converting a lot of my consoles over to using RGB SCART, for use with a Framemeister XRGB. A costly process. I’m looking at these switches now, and there’s only one thing I don’t truly understand because I’m new to the SCART format. Does the SCART cable carry audio? What I mean, is, do I need to connect those stereo RCA jacks from this particular switch box to get sound, or if I’m running my SCART cable from this box to my input, will the sound travel with it? The other thing I can’t figure out with this switch – if I DO have to use the RCA cables for sound, do I need a separate set of RCA cables for each SCART console, or does it output sound from all three SCART inputs just through one pair of RCA jacks/cables? I wish I could make that sound less complex but I’m really trying to figure this out before I buy a bunch of cables and switcher boxes. Yes, SCART carries analogue audio too. Is daisychaining a couple of these thingies advisable or would there be some quality loss? Bound to be a tiny bit of quality loss but you’re likely fine. Are the hama 100s, the vivanco sbx84, and philips swv2052w the same product? No, unfortunately they look the same but can perform quite differently. That means one of the pins isn’t making proper contact somewhere in the chain. I’m having the same issue (almost 4 years later, I know…)! My RGB button doesn’t seem to do anything at all, and with RGB source there’s a really strong blue tint. Straight into the monitor, everything is fine. Maybe my RGB button is busted? With or without the AV100S, and with every AV source and cable, my TV outputs an unnerving buzz that gets more noticeable when there are many light colours on screen. Any possible solution/help? How can I be sure I’m buying the original one and not a copy? I have one of these and It works great for the some systems and not so great for others? The snes ans MD look fantastic this includes the MDCD. However when I run the Gamecube and Master System through it, the quality varies. I seem to get a strobing through the picture, this is intermittent?. Now I have used the cables directly into the TV and there is no issue. Ive also tried them via the Hama without any other scarts plugged in and with all other inputs on the TV removed in order to rule out cross-buzzing, and it makes no difference. I can only assume the Hama is at fault. Would seem to be in that case. I still don’t understand why companies struggled so much to build a decent SCART switch. Why not use one of the switches that has 2 lots of RGB outputs? and back to my original question, can this product output composite signal for an american CRT and have my RGB output that I use in an HDMI converter ? 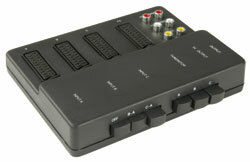 I wonder if this device: http://www.vivanco.com/Homepage/Products/Audio-und-TV-Equipment/Audio-video-accessories/Control-panel-and-amplifier/vivanco-16876-sbx-84-av-connector-3-3-channel-rgb-av-switch-box-with-copy.html?id=nsession has the same hardware? No way to know really. All their cables are shielded. I purchased a Gamecube RGB SCART sync on luma cable from them and it looks amazing. No checkerboards, no jailbars. I’m curious about the SCART A on that switcher. Since it can act as an Input and an Output, can you use this device as an RGB SCART splitter? Does it matter what kind of rgb cable each console uses? Like sync-on-composite, CSYNC, luma? Will the sync be preserved? The switch does not include a sync stripper so what goes in is what comes out. Thanks! I actually ordered one today. These are still available on Amazon UK as of today for anyone interested. I’ve just ordered one for £24. They’re sold by Amazon too, not some dodgy Marketplace seller so should be receiving this actual model. There are good reviews from people using them for retro gaming too, so looks like the genuine article. Only a few left in stock. I got to test mine today. I got it new from ebay and it’s the actual Hama one as there a lot of knock-offs out there. I wouldn’t recommend this device quite honestly. You do get noticeable picture interference and I have quality scart cables, double-shielded and all. It’s not horrible but it’s bothering me enough to prefer plugging/unplugging cables on my CRT’s single rgb scart slot. Dimitris on what set-up do you see interference? I had artifacts with good quality cable from https://www.retrogamingcables.co.uk for GameCube PAL (CSYNC over Composite video). But when I switched to pure CSYNC Nintendo Gamecube cable with built in sync stripper now it’s perfect! It’s worth mentioning that CSYNC SNES or even Sync over Luma for PAL SNES cables gives perfect output with Hama AV Selector 100S device. I have csync for n64 ntsc (through sync separator chip in the cable) from retrogamingcables, sync-on-composite for my super famicom and sync-on-luma for my av famicom. The thing is picture is fine with all my cables until I use the Hama switchbox. Also, there is audio interference as well, you notice the buzzing sound when you crank up the volume and compare without the switchbox. I take back my negative comments. The switchbox works fine. The problem was the supposedly quality scart cable I got to connect the hama to the tv. I found an old cheap rgb scart ribbon cable and the distortion is now gone. I have bought an Hama S100 to connect my retroconsole to my Samsung CRT, but if I connect the Snes via Scart Sync-on-luma to the Hama and not directly to the tv, I get a very noisy picture: do the Hama “lose” the sync-on-luma? Do I have a bad Scart cable from the Hama to the TV? Do I have to populate the other Scart sockets on the hama? Sync on luma should make no difference. I got this unit a couple of weeks ago, and it’s resulted in a visibly dimmer/degraded signal with any of my retro systems. I use high quality cables from retrogamingcables and amigakit as well. However, the problem might be that the shortest SCART cable I could find to go from the Hama to my XRGB Mini is 6 feet long (nearly 2m.) I’m thinking that perhaps the needlessly long cable could be the issue, but it’s very hard to find a shorter cable anywhere. Ideally, all I’d need is a male-to-male SCART gender changer, actually, since my Hama is right next to my XRGB Mini in my setup, but I can’t find any such gender changer anywhere, in any country online. Perhaps you got one of the bootleg versions of this switch? Has anyone had an audio buzz issue with these? I have x2 of these from amazon and if I bypass the Hama Switch and go right into the OSSC it’s perfect. If not, there is a faint constant buzz. Is there a way to open up the hama and ground it or something? Not sure if you have a Hama handy, but is your RCA Breakout for “Output TV” really quiet or not as good as the “Output” RCA’s? Both of my Hama’s experience this. I sold mine some time ago, but this kind of noise/buzzing isn’t uncommon on SCART equipment sadly. Can I have scart RGB output and Audio output separately at the same time? The reason that I ask is that I convert the Scart RGB to Component YPbPr which wont carry audio, so I’ll need a separate cable for audio. Been a while since I owned this but I believe it can yes.